Soon after my arrival in Athens, I came across a road sign, thankfully in English, indicating the direction to Marathona. Have I heard the name before, I asked myself? Not really, but it sounded similar to marathon -- the popular race held in Olympics and annually in many cities. Since the history of virtually everything can somehow be traced back to Greece, was it that the marathon race, so widely followed the world over, took its name from this Marathona? I needed to find out. 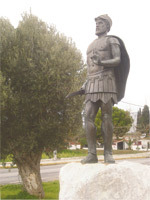 Marathona is best known for being the site of the famous Battle of Marathon, depicted by many historiographers as the 'clash of civilizations'. The Battle of Marathon was one of the first major Greco-Persian wars in the 5th century B.C, whose accounts were recorded in much detail by Herodutus, regarded as the 'Father of History', around 440 -- 425 B.C in his famous The Histories. The battle of Marathon took place between two major civilizations of the 5th century B.C. on one side was the vast Persian Empire, an unrivalled superpower at that time, and on the other Greece, fragmented into cities embroiled in internecine warfare yet inspired by an unbridled sense of liberty and enjoying the dynamism of fledgling democracy. The Greeks whom I spoke with were too happy to inform me that my instinct was correct. Not only was Marathona known for giving its name to the marathon race, but more importantly, it was better known to the present day Athenians as the location of the Marathona Lake, the main source of water supply to the sprawling and water deficient metropolis. Marathona, less than half an hour's drive from where I had first seen the road sign in the northern Athenian suburb of Kifissia, thus became an essential name on my places-to-see list. I first drove up to Marathona Lake one fine spring day, when Athens was deserted for Easter holidays. The winding road from Kifissia skirted the northern slopes of Mount Pendeli as it meandered past elegant mansions in the affluent northern suburbs of Athens. Athenian families use the densely wooded area around the lake as a picnic spot, mainly during spring and summer months, in a bid to escape the suffocating congestion and traffic of the city. The less adventurous ones prefer to sit on the terraces and lawns of the only restaurant overlooking the lake, enjoying the serene beauty and the delicious Greek food. 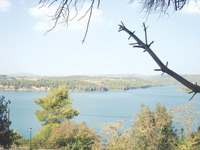 The largely non-descript village of Marathona itself lies a few kilometers beyond the lake, just before the road turns sharply left towards the town of Nea Makri. This setting, however, gives no indication of the rich history of the area. The best place to begin to appreciate rich history is the Marathona Museum, lying just off the road connecting the town of Nea Makri and village of Marathona, and overlooked by the Agrieliki hill -- one of the three hills that surround the plain, with the Aegean Sea to the east. 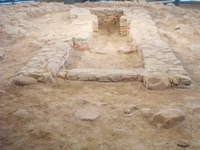 The Museum, constructed in 1975 at the Vranas excavation site, comprises seven rooms and is a repository of the relics of the area from as far back as the Neolithic and Helladic periods. During my visit to the Museum one relatively balmy day in the middle of winter, Ioannis, an employee at the museum, was forthcoming in giving me a general guidance about the area and the places that may interest me. The present day Marathona provides little signs of what took place there almost two and a half millennia ago (see Box). What must have been an open plain in 490 B.C where the two armies confronted each other is now a maze of roads, cafes, houses, supermarkets and taverns. Greeks, and countless tourists, now while away their time sipping coffee or enjoying the sunshine on the sandy beaches that dot the area, with modern jets overhead flying out of Athens' state of the art Eleftherios Venizelos Airport. History, however, still comes alive with a visit to the Marathona museum and other sites of historical importance, some now closed to visitors, spread out in the area. The Marathona Museum displays, among others, findings from the Tomb of the Athenians and remains from the Trophy of the Battle of Marathon. Also on display are ceramics from Pan's Cave (now closed to public) -- Pan being the god credited with having assisted the Athenians in the battle. A stony path from the museum leads to the Tomb of the Plataeans, about 150 metres away, where the remains of 11 Plataeans who lost their life in the battle are assumed to have been buried. A visit to the building adjacent to the museum provides for an eerie feeling since it contains one of the most important cemeteries from the Middle Helladic Period (2000 – 1300 B.C) where seven funerary tumuli were uncovered in the early 1970s by Spyros Marinatos. Unfortunately, the area around the museum and close to the Tomb of the Plataeans is now in a general state of neglect, a few olive trees standing between largely uncut grass and burnt out tree trunks. As suggested by Ioannis, my next destination was the Tomb of the Athenians, about 5 kilometres away. The tomb lies in a vast open, grassy area, properly lined with olive trees, its entrance overlooked by a fading statue of Miltiades. The tomb, or tumulus, itself is 10 metres high and 50 metres in diameter and had been lost in the plain over the centuries despite remaining a place of pilgrimage for Athenian youths well into the Roman times. Valerios Stais excavated it in 1890-1, after an unsuccessful attempt by Heinrich Schliemann in 1884. Exhibits discovered at the tomb adorn not only the Marathona Museum but also the National Archeological Museum in Athens. The lady at the entrance was categorical in stating that climbing the tomb was forbidden and that I could only go around it. The eerie feeling, which I first experienced at the Vranas excavation site, returned to me as I meandered in the area, which was the heart of a battle that altered the course of history. It has been said that for centuries after the battle, the clash of weapons, the cries of battle and the whinnying of horses could be heard on this site at night. Now there was nothing but peace and silence, the tomb a mere reminder of the turbulent past. My final destination, before I headed back to Athens, was the Trophy of the Battle of Marathon, set up by the Athenians after the victory, very close to the church of Virgin Mesosporitissa. After some difficulty, I was able to locate the place, having driven past fertile fields north of Nea Makri, a stone's throw away from the marshes which swallowed so many fleeing Persians. The original trophy was built of white marble, but has now been reconstructed close to the spot where its fragments were found. The site is in an even worse condition than the area around the Marathona Museum, missing even a boundary wall or a perimeter fence, and was completely deserted. Silence was broken in the minutes I spent there by a rickety scooter whizzing past on a side road, its driver probably unaware of and unconcerned about the history of the 10 metre tall white column. The legend of Pheidippides' run to Athens lives on, despite Herodotus' silence, the neglect in which lie the historical sites that dot the Marathona plain and hills and the progress and changed lifestyles of the twenty first century. And because of that legend, the marathon race remains a reminder of the 'clash of civilizations' in the fertile plains of Marathona 2,499 years ago. The writer can be contacted at [email protected]. Marathona is best known for being the site of the famous Battle of Marathon, depicted by many historiographers as the 'clash of civilizations'. The Battle of Marathon was one of the first major Greco-Persian wars in the 5th century B.C, whose accounts were recorded in much detail by Herodutus, regarded as the 'Father of History', around 440 -- 425 B.C in his famous The Histories. The battle of Marathon took place between two major civilizations of the 5th century B.C. on one side was the vast Persian Empire, an unrivalled superpower at that time, and on the other Greece, fragmented into cities embroiled in internecine warfare yet inspired by an unbridled sense of liberty and enjoying the dynamism of fledgling democracy. The Persian king Darius I had been extremely unhappy with Eretria and Athens for their role in the Ionian revolt (499 – 494 B.C) and had resolved to bring them within the Persian Empire. In 492 B.C he had sent an expedition to Thrace (in extreme northeast of modern-day Greece) and Macedonia under Mardonius. Finally in 490 B.C, the Persians set sail for Eretria and Athens, the only remaining belligerent city states in Greece. The Cycladic islands in central Aegean were successfully subjugated and Eretria was besieged and fell before the Persians turned their attention towards Athens. The plain of Marathona, northeast of Athens, provided them the ideal landing place. The Athenians, under Miltiades' behest, decided to confront the Persians in Marathona and marched to the narrow plain between the sea and Mount Agrieliki thus blocking the path to Athens. Herodotus records that Pheidippides, a long distance runner, was sent by the Athenians to seek assistance from the Spartans. He is said to have run approximately 240 kilometres to Sparta in two days, reaching there during the festival of Carneia, a sacrosanct period of peace. The Spartans could not march to assist the Athenians until full moon rose, leaving the Athenians to hold out (and perhaps fight) the Persians on their own for a few days. The Athenian army is said to have numbered 9,000 – 10,000 fighters who were joined by around 1,000 Plataeans, Athenians' allies from the ancient city of Plataea located south of Thebes. The number of Persian infantry (and cavalry) has been estimated by various historiographers as between 20,000 and 200,000. However, later day historiographers claim that the Persians outnumbered the Greek army two to one. The actual battle is said to have taken place at dawn on 12 September 490 B.C (some accounts also mention 11 September and 13 September) when the Athenians attacked the Persians upon receiving information the night before that the Persian cavalry had boarded the ships in a possible attempt to sail to Athens around Cape Sounion and take the empty city while the Athenian army was stuck in Marathona. The battle is said to have lasted not more than an hour, during which the Athenians, under Miltiades' command, are said to have beaten back the Persians owning to their superior strategy and better fighting equipment. A second round of major fighting took place as the fleeing Persians tried to board their ships to escape, with the Athenians in hot pursuit. According to historical accounts, 6,400 Persians were killed in battle, while countless others lost their lives in the marshes and swamps as they fled. The Athenians are said to have lost 192 men and the Plataeans 11 in all. Prominent Athenians killed in the battle were Kallimachos, General Stesileos and Kynegeiros, brother of playwright and poet Aeschylus. 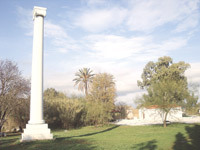 The dead of Marathon were honoured by being buried where they had died (Tomb of the Athenians), instead of the Athenians' main cemetery of Kerameikos. Finally, the Athenian army is said to have hurried back to Athens the same day, to prevent the landing of the Persian fleet at Phaleron in the south of Athens. According to a legend, Pheidippides was sent, after the battle, from Marathona to Athens to announce that the Persians had been defeated. He is said to have died of exhaustion immediately after announcing the Athenian victory. However, the historical accuracy of the legend is doubtful, and Herodotus does not mention this run in his accounts. Even the name of the runner was disputed by other historiographers and mentioned as Thersipus and Philippides. Despite serious doubts about its veracity, Pheidippides' legendary run, gave the idea of organizing a marathon race during the first modern Olympic Games in Athens in 1896. Needless to mention, the distance of the now popular marathon race approximately corresponds to the distance from Marathona to the centre of Athens.